On its way to dethrone HIV, LoveYourself, Inc. has sought a partnership with Mister Gay World Philippines Organization (MGWPO) to eradicate the social stigma on the disease and its relevant interventions. 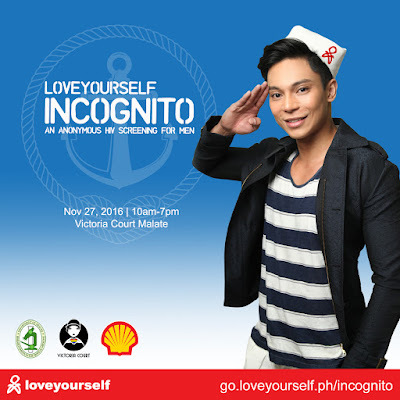 Advocating for timely testing and treatment, the LoveYourself-MGWPO partnership entails the promotion of the LoveYourself Incognito 2.0, which is the country’s most trusted community-based HIV screening that is free, anonymous and fast, set to happen on 27 November at Victoria Court Malate in Manila. 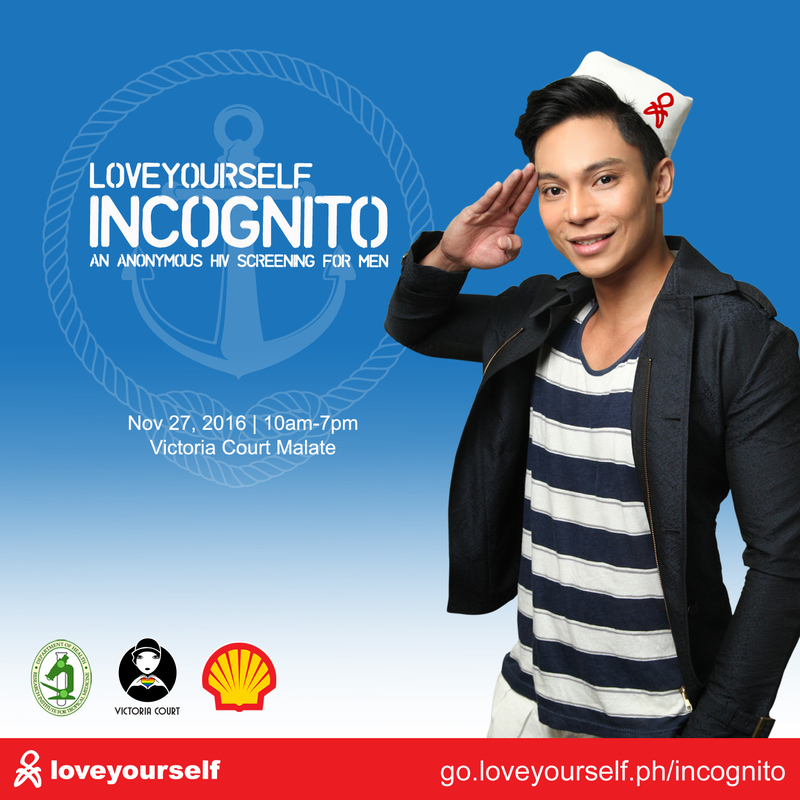 With the aim to continuously implement HIV and AIDS early detection programs, both organizations together with the Department of Health-Research Institute for Tropical Medicine (DOH-RITM) and Pilipinas Shell Foundation, Inc. are calling individuals to have themselves tested for HIV by signing up on go.loveyourself.ph/incognito. By erasing the stigma on the disease and relevant interventions, Soto said “[MGWPO] will use its influence to the immediate advancement of HIV and AIDS treatment and research, and will use its winners to be the voice of any medical breakthrough [on the disease]. Based on the latest advisory of the DOH-Epidemiology Bureau, there are 764 newly-diagnosed Filipinos living with HIV for the month of August alone. Meanwhile, only 611 persons living with HIV (PLHIV) from those diagnosed in August and earlier have subjected themselves to treatment. “Everyone must be responsible to his/her health and welfare and educate others about the importance of early detection of such diseases… By giving our candidates complete HIV and AIDS seminar through LoveYourself, they would be able to share [what they have learned] with others,” said Soto who also opened MGWPO’s doors for future programs with the advocacy group. Apart from conducting an HIV101 Seminar with MGWP 2016 candidates, the partnership became even more inevitable after three LoveYourself advocates donned HIV awareness and advocacy as their platform during the MGWP 2016 competition which concluded last 02 October at the University of the Philippines Main Theater. These advocates were Christian Khalil Vera Cruz representing Zamboanga del Sur who also landed as this year’s 2nd runner-up, Jesse Regin Nacilla of Cebu and Jerome Lacsa from Rizal who placed in the top 10 and top 15, respectively. Moreover, this year’s MGWP winner John F. Raspado of Baguio City and his 1st runner-up John Bench T. Ortiz are LoveYourself Incognito 2.0’s ambassadors together with Vera Cruz. Previous MGWP title holders, such as Mister Gay World 2015 2nd runner-up Christian R. Lacsamana, MGWP 2012 Carlito F. Rosadiño Jr. and MGWP 2013 Erimar S. Ortigas have used their voices to help the HIV cause by joining LoveYourself. LoveYourself held the first-ever Incognito last May 29 which helped 300 individuals know their HIV status. This is the highest number of individuals tested for HIV in a mass screening event in the Philippines. Back in July, LoveYourself also gained the support of the reigning Miss Universe 2015 Pia Alonzo Wurtzbach by providing financial assistance through the help of the Philippine Independence Day Council, Inc. an umbrella organization of Filipino American associations in the U.S. The advocacy group takes pride in this as the Miss Universe is the most influential ambassador of HIV advocacy to date. MGWPO is a non-profit organization supporting the fight against sexual prejudice, injustice and equality for the LGBT community across the world. The organization aims to modernize the image towards gays and break all stereotypes from the public perception. It also aims to continue the advocacy of HIV/AIDS awareness and treatment assistance for everyone. LoveYourself is a non-profit organization conducting HIV testing, counseling and peer education founded on enriching an individual’s self-worth. LoveYourself can be reached through its official website at www.loveyourself.ph, on Facebook at www.facebook.com/loveyourself.ph/and on Twitter at @LoveYourselfPh and Instagram at @loveyourself.ph.